Wanting something satisfyingly delicious without ingesting too much sodium and oil? Go for the real deal: the root (so to speak) of the item - blessed potatoes. Scrub potatoes well coz those peels are staying put! 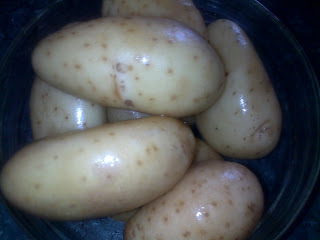 Chop and boil potatoes in salted water till soft, but still retaining their shape. Saute one of these babies along with some onions in a little oil till soft. Toss the boiled potatoes together with the sauteed peppers/onions. Sprinkle with feta cheese and garnish with a dollop of basil pesto. basil pesto adds more flavor! I know, you're eating healthy...but I have to share this; when frying french fries, I added pesto dried powder to the oil! adds another dimensions to the fries. but just add the powder before the fries are about to be done, otherwise you get burnt & bitter taste. I copied this from a restaurant I went in NYC. I am loving all of your post!!! Thanks so much!! !